Start any day of the year off right with these high-fiber, but still delectable, whole wheat pancakes. They're an irresistible guilt-free breakfast that's full of flavor, but not fat or sugar. Even better, they whip together in no time and are perfect for the whole family. 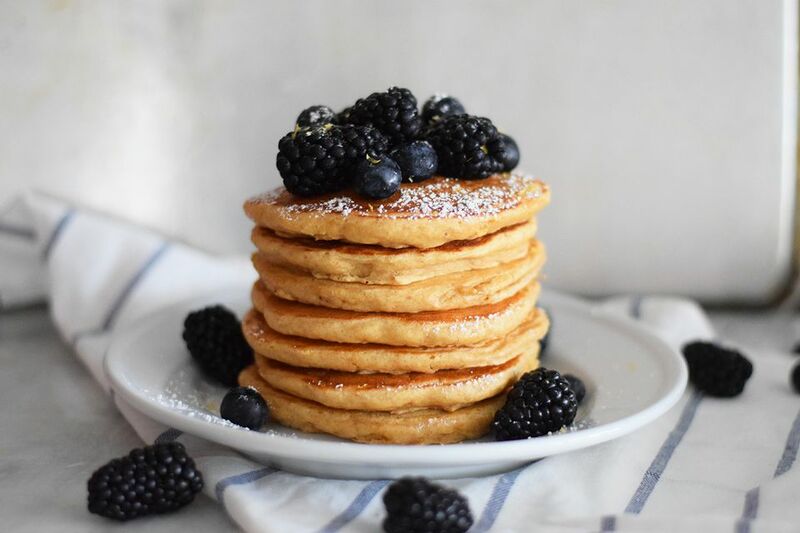 Enjoy these tasty pancakes with fresh fruit and a tiny bit of powdered sugar for just a touch of sweetness. If you aren't looking to cut back on sugar, then go ahead and add maple syrup or whipped cream. Whisk together the dry ingredients in a large bowl, including the ground cinnamon if you have chosen to add it to your batter. In a large measuring cup, combine the milk, egg, vanilla extract, and melted butter until completely incorporated. If you are including maple syrup, you can add it at this time as well. You can also just use regular sugar in place of the maple syrup. Add the wet ingredients to the dry ingredients in the large bowl. Whisk until just combined. A few small lumps are fine, but whisk out any large ones. Be careful not to overwork the batter or the pancakes will become tough. Heat your griddle onto high heat and turn the heat down to medium once it has been warmed up. Add the batter to the griddle and cook until the bubbles settle. Flip the pancakes and cook until golden brown. Top with fresh berries, a dusting of powdered sugar, and some lemon zest if you wish. You can use regular whole wheat flour, but the white variety—available from King Arthur Flour, Bob's Red Mill, and Trader Joe's—is an easier transition from typical wheat flour if you want a less robust flavor. Both should be kept in the freezer after opening since they can go rancid much more quickly than regular flour. This is due to the fact that they contain the hull on the wheat, which goes bad more quickly. It's easy to double or triple this small-batch recipe. Make a large stack of the pancakes for a crowd or let the pancakes cool and freeze them in plastic bags. Just pop them in the toaster when you are ready to eat them—it's a quick, easy, and wholesome breakfast for busy mornings. To reduce the fat in the pancakes, you can substitute the milk with a skim or dairy-free milk. You can also swap in applesauce or fat-free Greek yogurt for the melted butter. It is a 1:1 replacement ratio. Make a blueberry compote for the pancakes if you are looking to avoid adding sweet maple syrup. A compote creates a nice sauciness that you want with pancakes and a homemade version allows you to control the sugar content.